Mister Gunn & The Pistol Packin’ Mamas perform in front of the Woolworth Walk. Filmed on a gray spring day outside the Woolworth Walk, Mister Gunn & The Pistol Packin’ Mamas performed an exceedingly fun take on the Merle Travis tune “My Fat Gal.” In other hands, it’s one of those songs that could be interpreted as insensitive, or even outright offensive. But here, it’s neither. It’s just a great band playing a truly entertaining song. I’ve written before about the connection, or as I call it, conversation, between the street performing communities in Asheville and New Orleans, and there are few people that symbolize that interaction to me as clearly as Aaron Gunn. He’s one of the rare, talented locals that decided to leave the safe, protecting culture of the mountain valley and instead try his luck touring and performing, eventually settling in New Orleans. But he comes back to town a few times each year, generally bringing some fantastic performers with him to perform on the streetcorners. This particular collaboration, Mister Gunn & The Pistol Packin’ Mamas, is one of my favorite of these such groups. 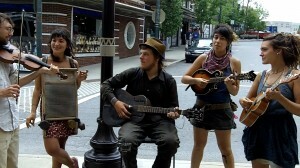 (Sharp-eyed followers of the Busk Break project will recognize members of other touring busking groups in this video.) It’s clear the five of them are truly enjoying the experience, and that attitude is infectious.